California is known worldwide for the remarkable basketry of northern Native Americans (O’Neale 192; Shanks 2006). Authors Turnbaugh and Turnbaugh, who wrote Basket Tales of the Grandmothers (1999), looked at basketry like a language and argued that one can observe the changes in culture through basketry. Basketry is also helpful when looking at the transportation of vital information and the importance of oral tradition from generation-to-generation. Many of the basketry materials are best gathered after a fire has burned the gathering area, which creates new growth that is straighter and more pliable. Beargrass (Xerophyllum tenax) is off-white and used for overlay work. Peeled hazel (Corylus) and grey willow (Salix) often serve as the foundation rods of a basket. The stem of the maiden hair fern (Aduantum) is used to add color for designs that have two sides: a dark red side and a shiny black side, with the red side being the more brittle one. Woodwardia fern (Woodwardia) is dyed a reddish color and has two strands that must be taken out and dried. These strands are chartreuse in color, which ages to tan until dyed with the inner white alder bark. Porcupine quill also is used in basketry; the tubular quills are rounded to overlay the root. The quills are dyed with wooden moss (lichen) and Oregon grape root and they are hard to manipulate. Christie Vigil (a Yurok and Hupa Native American who is the administrative assistant at the California Indian Basketweavers Association) commented that gathering is a long process; one has to gather for a year before beginning to weave (interview by author). 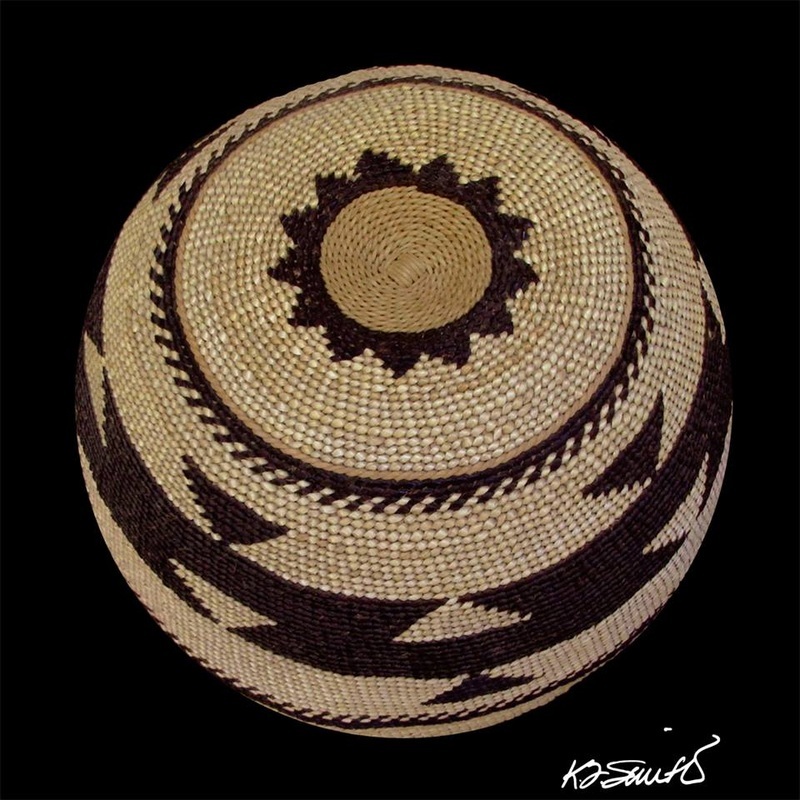 Kathy Wallace, a basket weaver and lecturer on basket weaving and California Indian art at San Francisco State University, discussed the materials used for basket caps, saying that the sticks must be very long and narrow in order to keep the shape of a cap and not cause the cap to bow inwards. The quality of sticks for basket caps is hard to come by and the weaver sometimes has to save up for years before gathering enough material to weave a basket cap. Wallace discussed how basket caps are worn by many individuals, including women, men, and young girls, and how practical the caps are. Having a basket cap would be convenient for measuring tobacco (a type of currency) and as a cup for drinking water or holding berries. Basketry is an extremely difficult skill to develop and to make a basket cap is a high achievement. 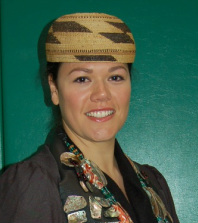 O’Neale explained in her 1932 dissertation, Yurok-Karok Basket Weavers, that “All might weave baskets, only a few could make a wearable cap” (43). O’Neale specifically discusses the three types of basket caps (root caps, fern caps, and grass caps), and how they are usually named after the predominant material (192). 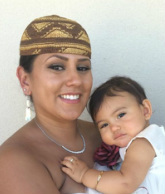 In the book, Her Mind Made Up, an interview with Georgiana Trull reported that, in Yurok, “the basic names are athl-wah eka (Indian cap) and wapa-wah-eka (spruce cap)” (Johnson and Marks 1997). "When you weave a cap you represent your whole family, and more likely than not they’re going to be worn at ceremonies and going to be scrutinized and if it is really good they will come up and ask ‘Who made the cap?’ And if it is really bad, people will come up and ask ‘Who made the cap?’ The cap maker and the weaver represent your family." 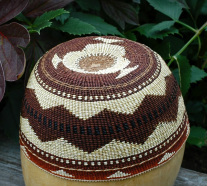 Basket cap weaving shows talent; there is no measuring of the person’s head that the cap is being made for, there is no trying the cap on, and yet these caps remain perfect in dimension. They are made to match the dimensions of the wearer’s hand. In their book, Johnson and Marks (1997), and Wallace, in an interview with the present author, each explained the technique in which the button (center of basket) to the edge is measured from the tip of a person’s finger to the second knuckle, which is how the weaver knows when to start the second zone of the cap. The second zone is measured by the length on one’s middle finger. The third zone is measured by the length on one’s thumbnail. Once the cap is finished, the wearer should be able to spread her/his hand open inside the cap. Working caps are rounder than ceremonial caps and made to fit the head tighter. Working caps are worn to help with the pressure of the tumpline from a burden basket (O’Neale 192) or a baby basket, according to Wallace (2010). Wallace also talked about working caps having fewer colors and designs, but still having the three zones described previously. 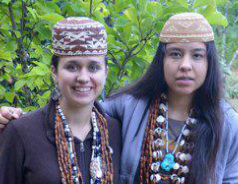 Wallace noted that another use for a non-ceremonial basket cap would be to keep long hair back from one’s face (2010). Ceremonial caps have a different shape and were made from different materials than working caps. Ceremonial caps tended to be flatter on top (O’Neale 192). Men wore work caps made of roots with plain or no designs (O’Neale 192, 42). Wallace noted that all caps had multiple functions; men’s caps would be used to measure tobacco and to drink water (2010). that would not fit anyone today; weaving such a cap would take less time and use fewer materials. The basket weaver knew the cap would end up sitting on a mantle or hooked on a wall, never being worn, which is why so many made-for-market caps remained in such good condition. 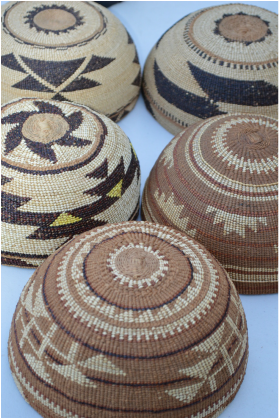 Looking at the social life of a basket cap is fascinating, from identifying plant materials and learning about the cultural knowledge needed to know when and where a person can gather, to understanding the guidelines of weaving. Basketry is an integral part of life for Northern California Indians. Every cap has a story... click a pic to read more!